In The Shared Wisdom of Mothers and Daughters, the inspirational follow up to the beloved Things I Want My Daughters to Know, lifestyle philosopher Alexandra Stoddard reflects on the lessons she’s learned from her own daughters and offers more words of wisdom in return. As a mother and grandmother, Stoddard shares some of the most enlightening conversations she’s had with other women and their daughters. Filled with enduring and heartfelt stories, Stoddard’s The Shared Wisdom of Mothers and Daughters delivers lessons about love and happiness that have been shared and learned by countless generations of mothers and their daughters. 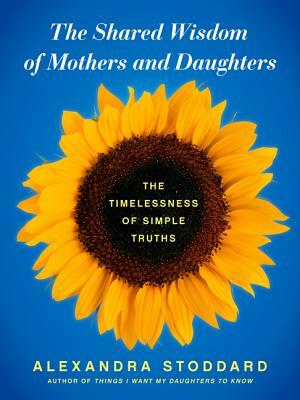 Alexandra Stoddard’s The Shared Wisdom of Mothers and Daughters: The Timelessness of Simple Truths is a beautiful keepsake that celebrates the deep connections between mothers and daughters. Author of twenty-four books, Alexandra Stoddard is a sought-after speaker on the art of living. Through her lectures, articles, and books such as Living a Beautiful Life, Things I Want My Daughters to Know, Time Alive, Grace Notes, Open Your Eyes, and Feeling at Home, she has inspired millions to pursue more fulfilling lives. She lives with her husband in New York City and Stonington Village, Connecticut.